Red Collar Brewing from Kamploops BC, has made Jammer Café the official tasting room in Vancouver to experience another one of the top beers in the province. Red Collar Brewery opened in 2014, the latest venture from brew master David Beardsell, who has been a mainstay to the BC brewing community for over 20 years. Training in breweries from Germany and around the world to expand his awareness of the craft. 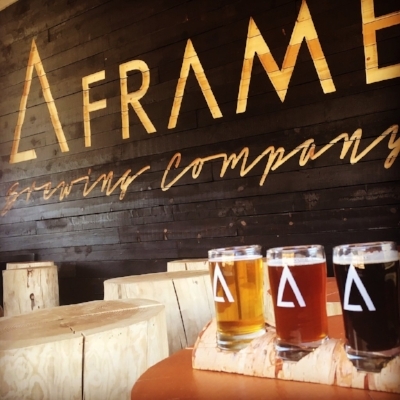 Direct from Squamish BC, Jammer Cafe has added a selection of beers from A-Frame Brewing. Come build a flight and mix up beers from 2 breweries. A traditional English style IPA using primarily Australian hops. Red Collar IPA is brewed with Kamloops water, Canadian malt, English ale yeast, and a blend of Pacific Northwest hops. Unpasturized, unfiltered and naturally carbonated. A medium bodied ale with a crisp, dry finish. The use of Pilsner and French aromatic malts create a golden colour with biscuit and honey flavours. Fermented at lager temperatures with Red Collar’s proprietary Belgian yeast strain. Unfiltered and naturally carbonated. Originating as a traditional Belgian Trappist style beer, rich in coffee, chocolate and toffeenotes. Red Collar Dubbel is brewed with Kamloops soft water, Belgian malt, German hops and a blend of Belgium Trappist yeasts. Unpasturized, unfiltered, naturally carbonated and vegan friendly. A golden coloured ale brewed in the Trappist style with a blend of Belgian yeasts. Hints of coriander meet banana and clove esters. Mon to Wed. 8 am to 10 pm. Thurs. - Fri. 8 am to 11 pm.